So many people are looking for cherry ice cream recipes right now, I thought I would go ahead and share this wonderful version of the usual cherry ice cream we make. The combination of chocolate and cherries together is delicious. I paired this with a homemade cherry pie and thought I would go ahead and include that recipe for those of you who might want a good pie recipe. You can make any kind of berry pie with this recipe - blueberries, raspberries, huckleberries, or blackberries. Heat cream, half n half and sugar in a small saucepan until sugar completely dissolves. Add vanilla and cherry puree. Transfer to a bowl or 4 cup pyrex and refrigerate, stirring occasionally, until completely chilled. Transfer to your ice cream maker and process for 25 minutes or until as thick as desired. Add chocolate and process a minute more, just until mixed in. If you are not eating the ice cream right away, transfer to a plastic container and cover surface completely with plastic wrap and freeze. Place dry ingredients in a food processor and process for a couple seconds. Cut up the butter and add through feed tube, processing using on and off pulses, until it resembles course bread crumbs. Add ice water slowly through feed tube (do not add ice) only until the dough comes together into a ball. Remove dough and cut into two pieces, one slightly larger than the other. Flatten into discs, place each between two floured sheets of plastic wrap or wax paper and refrigerate for one hour. 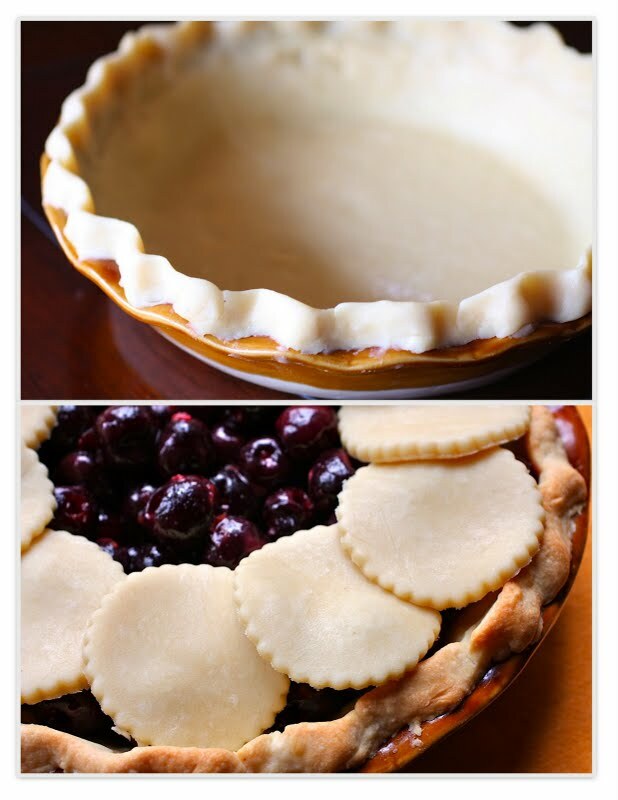 Prebake the pie shell*: Preheat oven to 400 degrees. Roll out the larger piece of dough between two floured pieces of plastic wrap or wax paper, to make rolling easier. If dough is not pliable yet, whack it with the rolling pin a little. When dough is slightly larger than a 9 inch pie pan, remove top piece of plastic wrap and place rolling pin on dough and gently roll up dough around pin, transfer onto the pie pan and unroll dough. Press into pie pan and crimp the edges as you like. Place a piece of parchment paper or foil over dough and fill with pie weights or dry beans. Bake until the rim of the crust just feels set, about 8 to 9 minutes. Remove from oven and carefully lift the foil or parchment paper and the weights from the crust. Prick the bottom and sides of the pie crust in several places with a fork. Return the shell to the oven. Bake until the crust is almost done but not browned, about 8 minutes longer. Cool the pie shell for about 15 minutes before filling. In a large bowl, toss the cherries with the sugar, flour, nutmeg, cinnamon and lemon zest and juice. Transfer to the pie crust. Dot with the butter. Roll out the remaining dough into a circle the size of the pie. Using a 2 inch biscuit cutter, cut out rounds of dough. 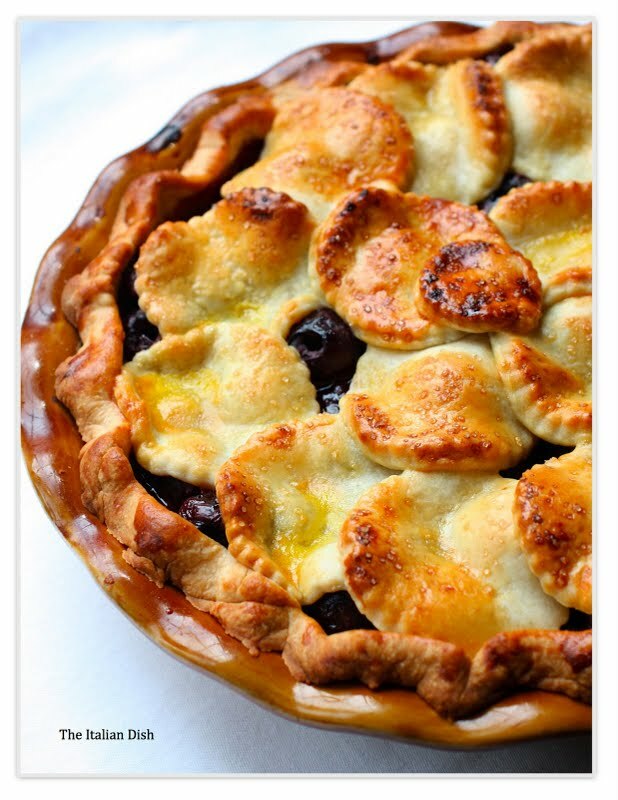 Place in a decorative pattern around the top of the pie. Gather scraps and continue to roll out dough and cut rounds until the top has been covered. Lightly beat the egg with the cream. Brush the top with the egg glaze and sprinkle with the sugar. Cover the rim of the pie with aluminum foil strip or a pie shield, which is what I use, to prevent the rim from overbrowning. Bake for 20 minutes. Reduce the oven temperature to 350 degrees and cook until golden brown, watching carefully, for about 30 minutes longer. Transfer to a wire rack to cool. *Improve your pie making. Pre-baking your pie shell before adding the filling will ensure that you have a nice crisp bottom crust. If you don't, the filling can soften the bottom crust and it won't be as good. It may sound like a lot of trouble, but once you do it and realize how easy it is, you will want to always do this. Invest in some pie weights and prebake your pie crusts. For years, I had a jar of dried beans that I used as pie weights and they worked fine. Then I bought these nice pie weights and they work even better. To prevent the rim of the crust from overbrowning, you can cut out strips of aluminum foil and gently place these over the rim. Using this pie shield, however, is far easier . I use the Cuisinart ice cream maker. This makes 1 1/2 quarts of ice cream. If you ever want to do a double batch of ice cream, however, or make two kinds of ice cream the same day, you might want to invest in an extra freezer bowl. You cannot use the same freezer bowl the same day to make ice cream. It will not be cold enough for the second batch, even if you place it in the freezer for a couple of hours in between batches. To make pitting cherries faster and easier, I use this cherry pitter from Leifheit. You really won't believe how fast you can pit cherries with this thing. What a killer combo! Yum. I'm also getting ready to put up a cherry chocolate ice cream, but I have nothing like your fabulous cherry pie. It's a rustic work of art. I'm going to have to make it. The nutmeg and cinnamon are great additions. I LOVE the decoration atop your pie, truly cute! Thanks...I love cherry and chocolate together. I plan to make this ice cream tonight. The crust on that pie is to die for! And the ice cream sounds amazing too. This is a treat for the eyes Elaine, you could wrap this up in a pretty box and sell them by the dozens! Both of these recipes highlight a wonderful ingredient, which I believe is just coming into season in Michigan, right? But what I really appreciate is the list of tips you provide at the end of the post. Anyone can publish a recipe, but the real connection amongst cooks begins when we reveal the secrets to our success. Thanks for both! P.S. I love that you have included Zingerman's in your side bar. Brings me back to my days at U-M! Yum! I just made something similar. There's nothing better than fresh homemade ice cream and pie! 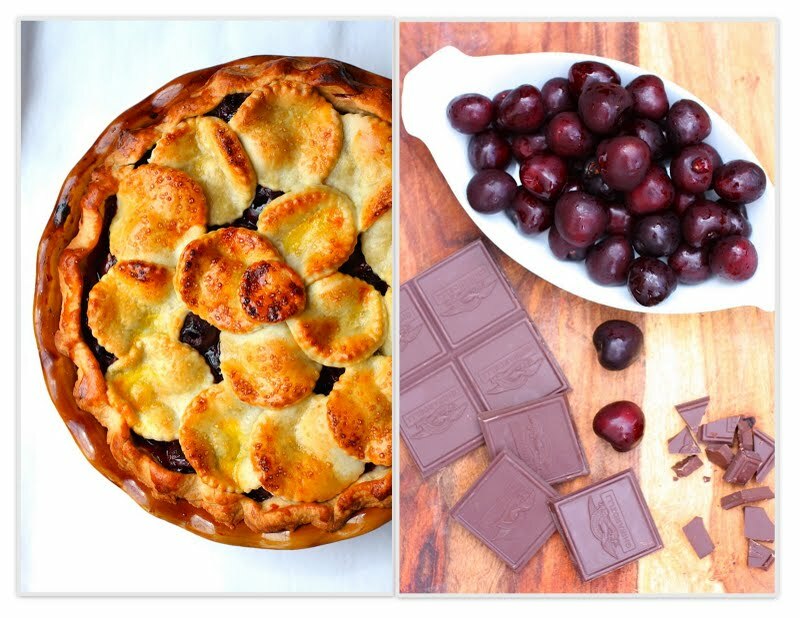 I'm so glad to find this recipe, looks gorgeous...I was wondering though, it's snowing outside so it's not exactly cherry season here in NJ right now, could I defrost some frozen cherries? I try to buy in season and locally if I can...Thanks for the great recipe! 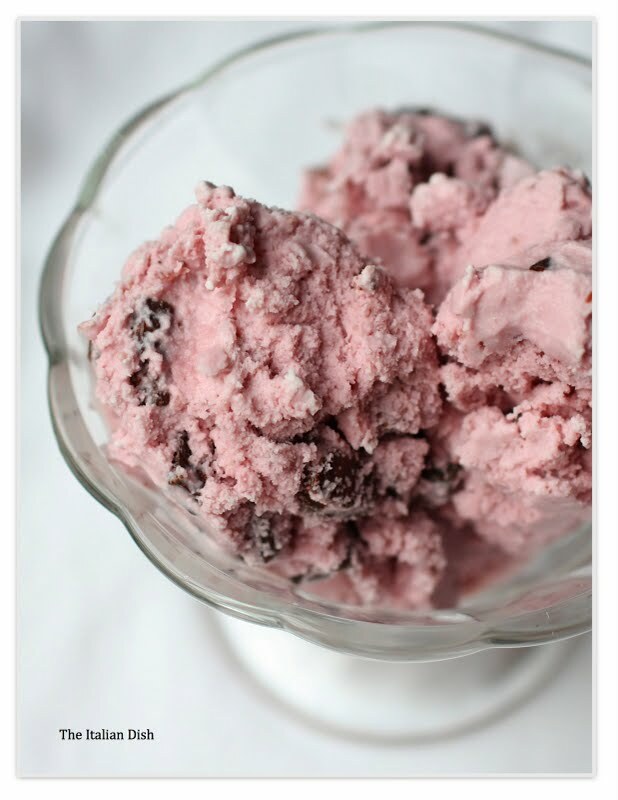 Dawn: I have used frozen cherries that I froze when they were in season to make this ice cream. It was good , but not as good as using fresh. There was a definite difference. Try it and see what you think. I know they are not in season, but I saw fresh cherries (from I don't know where) in my grocery this week and they looked very good. You can also use a different fruit, too. 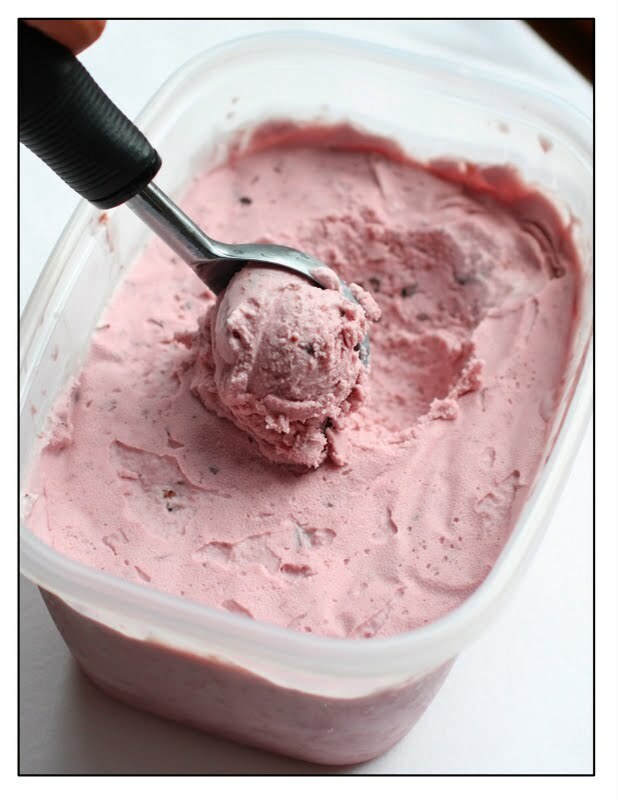 The cherry chocolate chunk ice cream comes up when you hit the cherry pie link in the recipe index. Kate: Thank you - but the cherry pie recipe is in the same post as the cherry chocolate chunk ice cream.